Tractor Supply Co. and the National 4-H Council have launched the Paper Clover event to raise money for youth. TSC customers through April 7 purchase a paper clover during checkout or online with a purchase. Proceeds provide scholarships for 4-H programs nationwide, where youth will learn about everything from animal care and woodworking to professional networking and civic responsibility. Over the past nine years, TSC and 4-H have raised more than $12 million. Tractor Supply in Arcadia is at 1701 E. Oak. If you are a gardener and you have lived anywhere else, you realize pretty quickly that Florida is different. Learning to work within Florida’s specialize ecosystems takes special measures. In Florida we call it Florida-Friendly Landscaping. Part of the University of Florida’s Yards and Neighborhoods program, it was developed to address environmentally safe methods to landscape and maintain your yard. Florida-Friendly Landscaping is based on nine principles; most of which deals with protecting water. Although it may seems that Florida has a lot of water, it’s mainly water quality that gives us concern. You’ve probably heard of the water problems to the south in Lake Okeechobee and other coastal tributaries. Most of these problems involve algae blooms which come from nutrient overloads. These nutrient come from a lot of sources and Florida-Friendly Landscaping is designed to minimize these impacts while you create a beautiful yard. Thursday, March 28 the University of Florida, IFAS Extension is offing a free class on Florida-Friendly Landscaping. The class is called Florida-Friendly Talk and Tour and will take place at Robbins Nursery, South in Sebring at 10 a.m. 863 402-6540, Facebook at Hometown Gardener, email at davidaustin@ufl.edu. This is the seventh year the London-based education marketing and networking firm has compiled rankings specifically for Agriculture & Forestry. For the last three years, Wageningen University in the Netherlands earned the No. 1 spot in Agriculture & Forestry. Top honors for the report’s first three years went to University of California, Davis. Q: I already have bass in my pond. Will it improve fishing if I stock more fingerlings? A: Generally not. If you already have significant numbers of predators in your pond, the odds are that most of your newly stocked fingerlings will be eaten. Also, the addition of adult fish may increase the numbers, but it rarely increases the standing crop. The amount of fish a body of water can support is generally dependent upon the availability of food. Q: Will the government stock my pond for free? Q: I’d like to purchase some game fish for my aquarium. Is this legal? Q: Do you recommend stocking tilapia in my pond? A: No. Although they can provide excellent forage for bass, they can also overpopulate a pond. In addition, they are temperature sensitive and may not survive in the northern part of Florida. A district judge has ruled against a lawsuit challenging a sharp increase in the adverse effect wage rate in Nevada, Utah and Colorado. Peri & Sons, a Nevada vegetable grower, and the National Council of Agricultural Employers brought the lawsuit against the Department of Labor. The new rates rose 22.8 percent over 2018’s rates in the three states, increasing from $10.69 to $13.13. The lawsuit’s claims go to the heart of the AEWR rules. It says DOL failed to determine if U.S. workers were adversely affected by employers’ use of these temporary foreign workers. Therefore, AEWR isn’t necessary to protect them. NCAE called the process arbitrary and capricious, and therefore DOL was overreaching by imposing unlawful wages. The market should determine wages, NCAE argued. I’m not sure if she meant to imply that growers were somehow associated with slavery, but as I say it’s a word that gets noticed. And being pure ugly, it should. But I doubt she thought growers would get so offended. It’s not that there aren’t urban legislators in this country who are anti-farming—or anti-pest control, or anti-irrigation, which is the same thing as being anti-farming. But most are just ignorant. A sharp editor here at Meister Media Worldwide remarked on the anti-slavery legislation, saying it’s too bad so many urbanites are so out of touch with farming, especially when the farming in question is being practiced just a couple hours from their districts. These urbanites have lost touch with reality, she lamented. Most of America is so far removed from where their food comes from, folks have no clue. Farmers have gotten so amazingly productive that food has gotten relatively cheap; it’s not an issue for average citizens. Though it will be if the legislators interfere too much in the way farmers farm. Complaining about the ignorance of urban legislators is certainly not going to solve anything, though education might. But it’s going to take a lot of work, more than it ever has. The situation is particularly clear here on the West Coast, where the political power in all three Pacific Coast states—Washington, Oregon and California—seems to be growing more along the coast. Most of the farming in each state takes place inland, which means less of a voice for, and more ignorance of, farm country. You’d be surprised at how much a lot of the 99 percent of the population not involved in ag would be fascinated. Millennials are increasingly interested in where their food comes from, especially items consumed whole like fresh fruit. So that means they’re interested in you. Wash and hull strawberries. 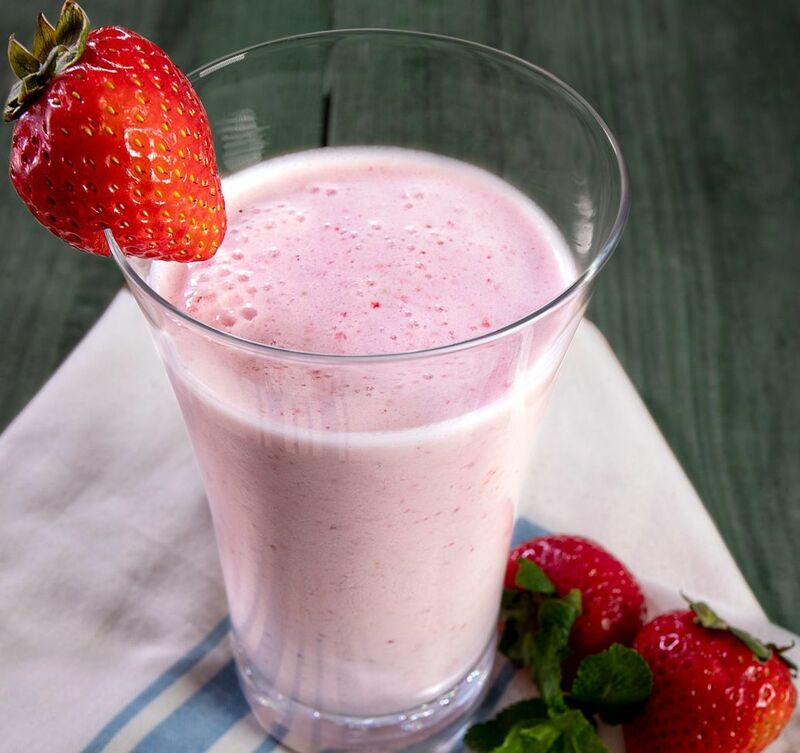 Place strawberries in a blender with half of milk. Make sure lid is on tight. Blend on high speed until smooth. Add frozen yogurt, remaining milk and ice cubes and continue to blend until smooth and creamy. Serve immediately. Pour any leftovers into an ice cube tray and freeze for later use.